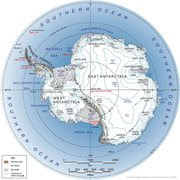 The South Pole: Solo but not Alone: Touch down on Antarctica: and a perfect day! 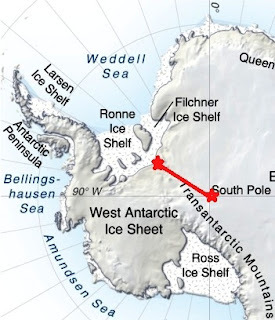 Yep, I have now set foot on Antarctica and am the furtherest south I have ever been...79 degrees... 21 to go now, but the rest is on foot! We left Punta Arenas at midnight, and a pitch black night, when we left, but soon we crossed the 24 hour sun line and a whole new wonderful world opened up below the aircraft First the crackeed sea ice, and then the mountains of the Antarctic Peninsular. ... Aircraft sort of bounded down the runway which was clearly not flat but made of undulating 'hills'..It felt like we were a boat riding the huge swells of an ocean. As the aircraft door opened up the most amazing surprise waited us: A perfect, blue sky, windless, 'beach weather' day, at -13 C. There we were dressed for -20's so it was soon down to stripping layers off. First task was bulding my tent, and home for the next two days. I was just so excited I couldn't head off to catch up on sleep as most others did, and started the final preparations of packing the sled, etc. After that I strapped on my ski's and went for a freedom test ski... Gee, was it great to get back on the ski's and now 'It's' REAL close now.